This article is part of [Sí], a personal project curatedby Marta López García where she wills to shed light on a twice silenced reality. 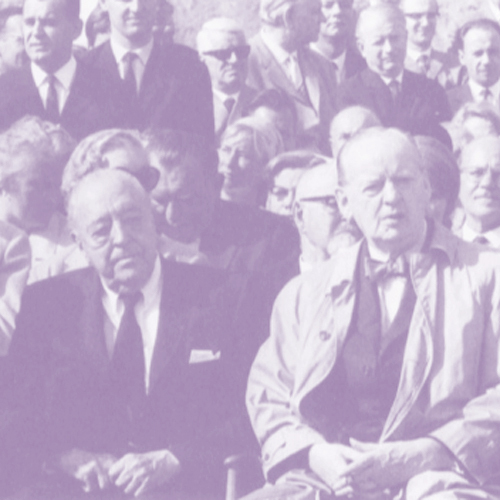 The goal remains to recover and spread pieces of architecture displaced to the periphery; although this time focused on the work of female architects. 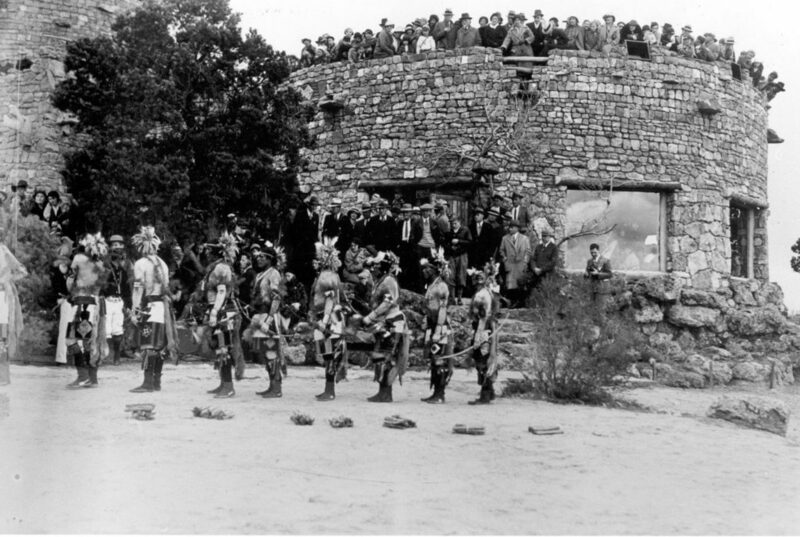 Ten years after finalizing Phantom Ranch, Mary Colter was asked to design a building that was able to catch visitors’ attention and create a relationship between them, the landscape and the Native Americans’ culture. 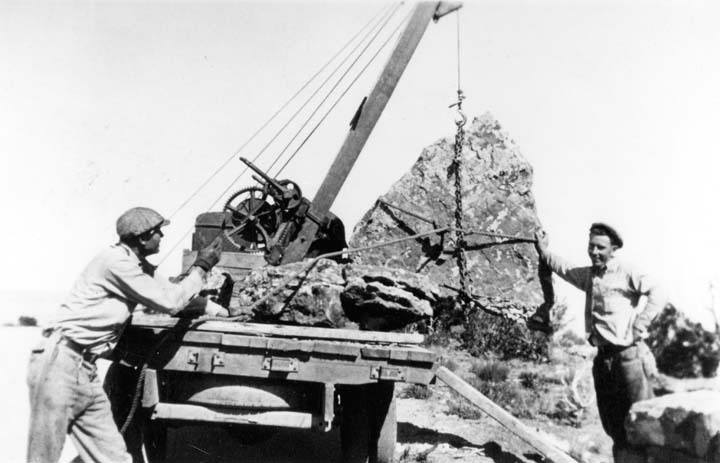 The site, which was known as Navajo Point at the time, was accessible to the public just one year before and it comprised of a road that connected the South and East rims. The area was relatively underdeveloped compared to the cluster of tourist attractions stationed twenty-five miles to the South. The view from the rim´s edge was and is breath-taking and it is understandable why the Harvey Company was interested in develop the spot. The company’s decision to assign the project to Colter was wise, it needed someone able to design a building rich with history and did not attempt to compete with the view. 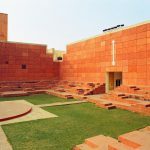 The architect turned again to the ancient Indian ruins for inspiration. 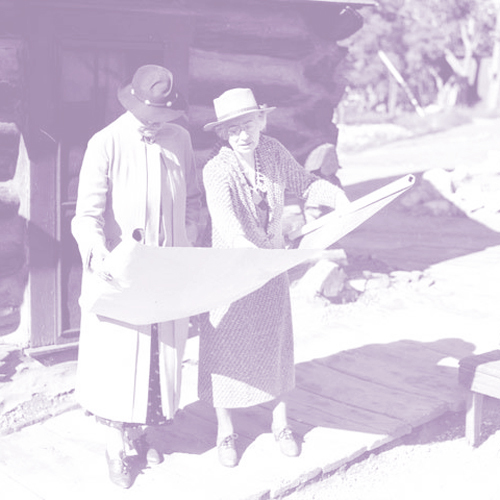 Diez años después de la finalización del ‘Rancho Fantasma’, Mary Colter recibió el encargo de proyectar un edificio capaz de atraer a los visitantes del Gran Cañón y de crear una relación entre ellos, el paisaje y la cultura indígena. El lugar elegido, conocido hasta entonces como Navajo Point, fue accesible al gran público sólo un año antes y consistía en una carretera que conectaba las orillas sur yeste. 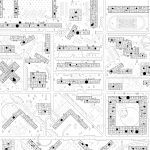 La zona se encontraba prácticamente sin desarrollar comparada con la cantidad de edificaciones y atracciones turísticas situadas 25 millas al sur. 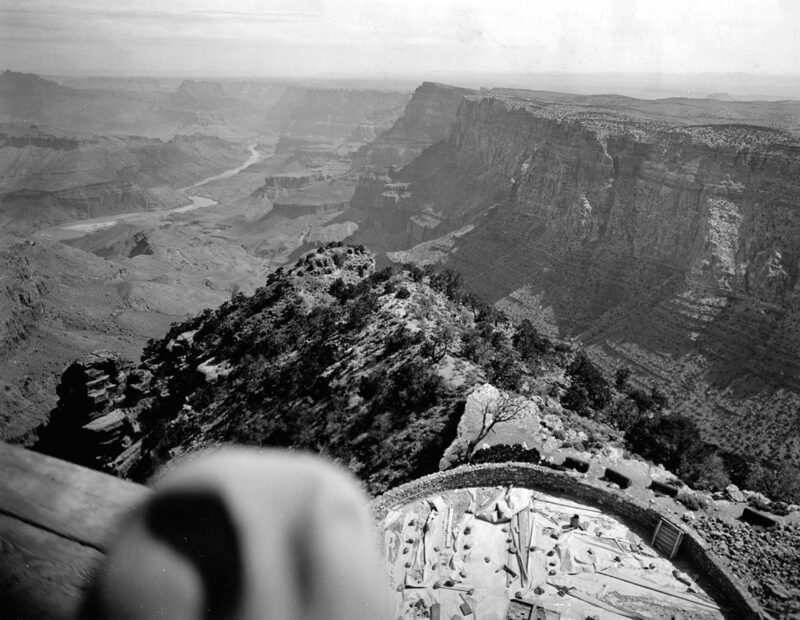 Las vistas desde el lugar eran y son impresionantes; razón suficiente para que la Compañía Fred Harvey estuviera interesada en construir en ese enclave. La decisión de asignar el proyecto a Colter fue sabia, necesitaban a alguien capaz de diseñar un edificio rico en historia pero que no pretendiese competir con las vistas. La arquitecta volvió una vez más su mirada a las antiguas ruinas indias en busca de inspiración. 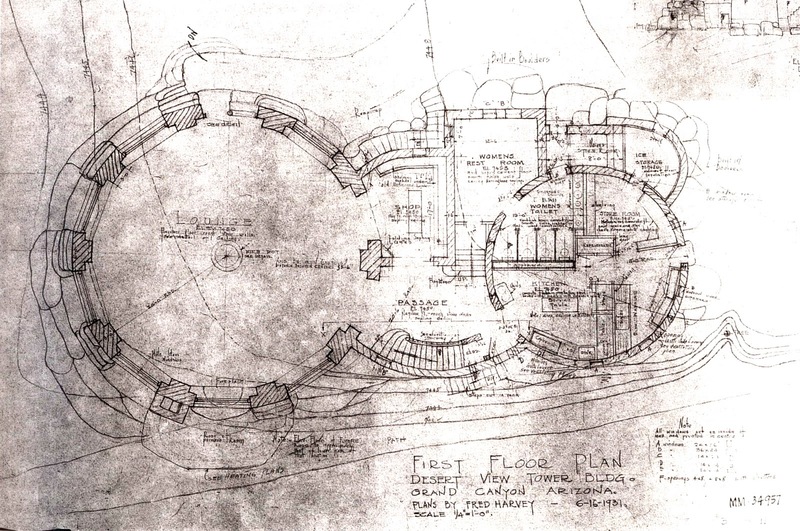 Ground Floor Plan, probably made by Mary Colter. 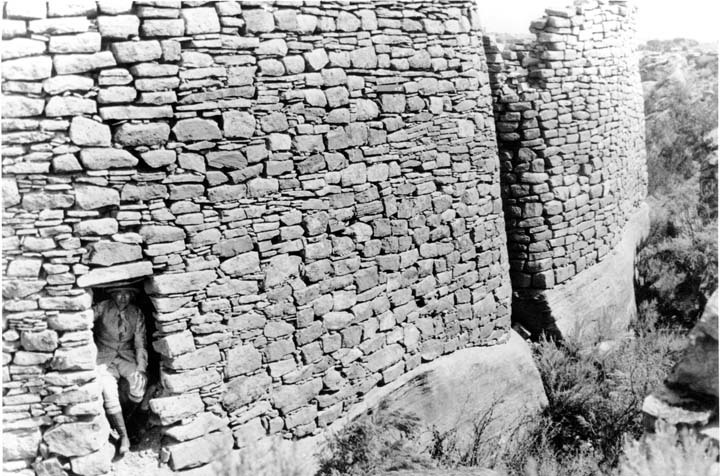 Fred Harvey co.
As a starting point Colter spent six months studying ancient Puebloan ruins, especially Hovenweep and Mesa Verde. 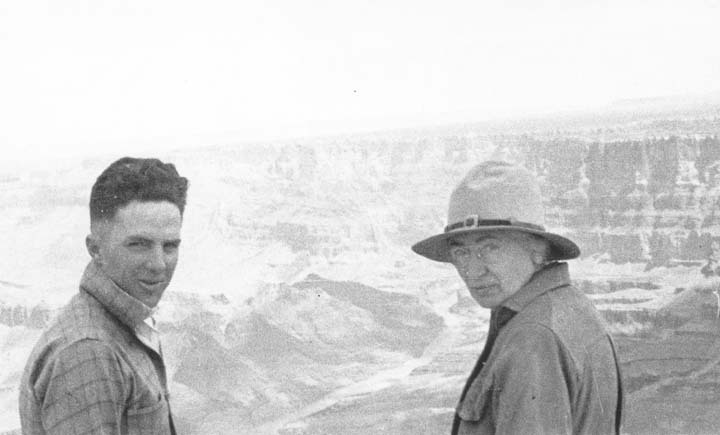 Those trips, along with her wide experience in working on the Grand Canyon and her relationship with the Hopi, allowed her to carry out theproject. She decided to design a watchtower next to a kiva as she could find these two buildings standing together in some of the visited places. The proposal was, on her words a ‘Re-Creation’ of the past, homage to the desert´s ancient ruins and to the people who have abandoned them. 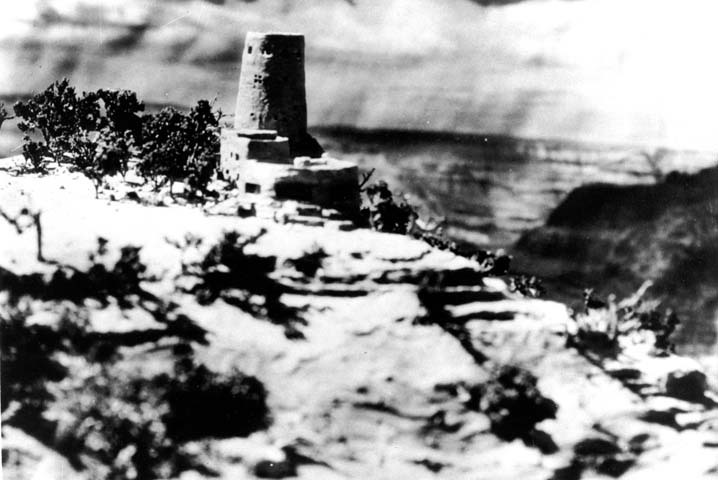 The architect built a clay model of the proposal on a site model built with the help of one of the Park’s naturalist. Thus she was able to take photographs and explore different scales and points of view. Later they built a 70 feet wooden platform on the exact location and of the same height than the final tower to ensure the quality of the view. 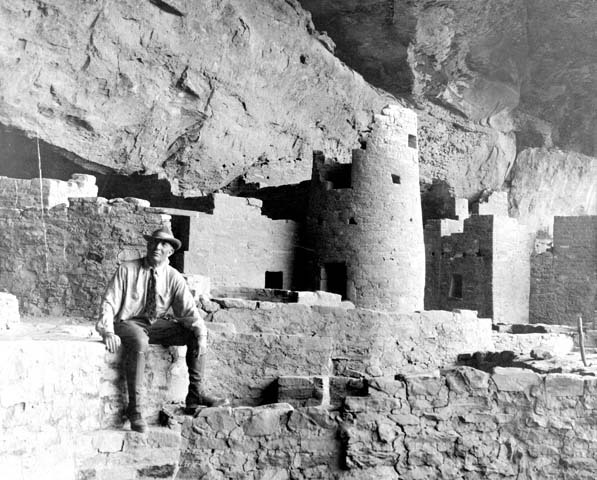 Colter pasó seis meses estudiando in situ los restos de varios poblados abandonados, centrándose especialmente en Hovenweep y Mesa Verde. 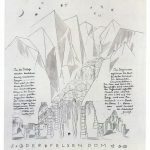 Estos viajes, junto consu amplia experiencia de trabajo en el Cañon y su relación con los indios Hopi, le permitieron llevar a cabo el proyecto.Así decidió diseñar una torre mirador junto a unakiva, ya que en varios de los poblados que visitó estas estructuras se encontraban una al lado de la otra. La propuesta es, en sus palabras, una reinterpretación del pasado, un homenaje a las ruinas del desierto y a sus pobladores. Como parte del proceso, la arquitecta desarrolló una maqueta del edificio en arcilla sobre el terreno modelado con ayuda de uno de los naturalistas del Parque. La maqueta y las fotografías que hizo de ella, le permitieron explorar la escala de la propuesta desde diferentes puntos de vista.Más adelante levantaron en el lugar una plataforma de madera de la misma altura que la futura torre, 70 pies (21 metros), para asegurarque las vistas eran las deseadas. Desert View Watchtower elevation looking West, probably made by Mary Colter. Fred Harvey co. 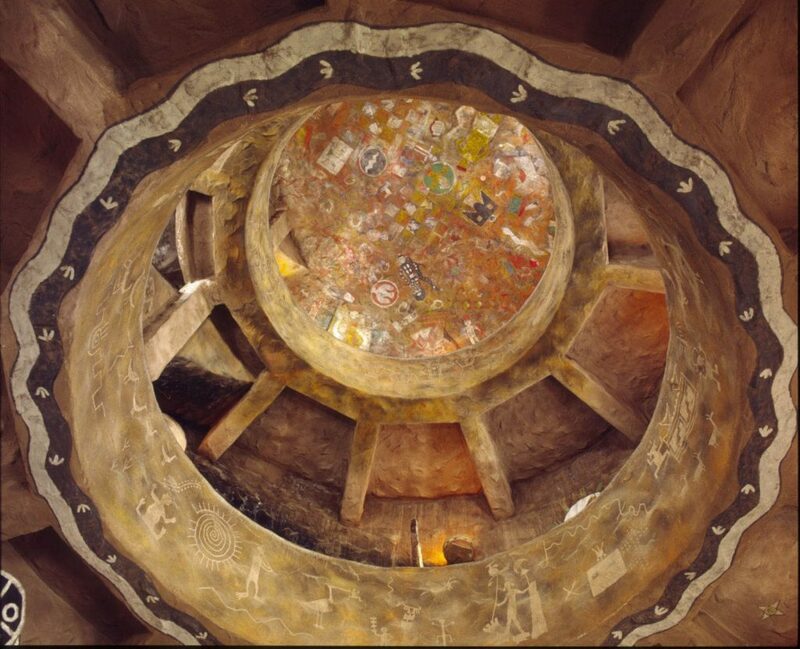 Visitors access the Watchtower through a circular room that recreates the ancient kiva. This structure was historically built underground, with a wooden flat roof on top and used for religious and spiritual ceremonies or political meetings. 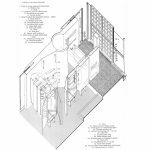 Its main features are a circular fireplace in the centre of the room and a wooden ladder to enter the room through its only opening located in the roof. Colter´s sough to keep this atmosphere while responding to the purpose of the building, therefore it was built at ground floor level.On plan it has also a circular shape but instead of a blind wall around, large windows were open on the stonework, including on top of the proposed fireplace for allowing people to enjoy the stunning views. 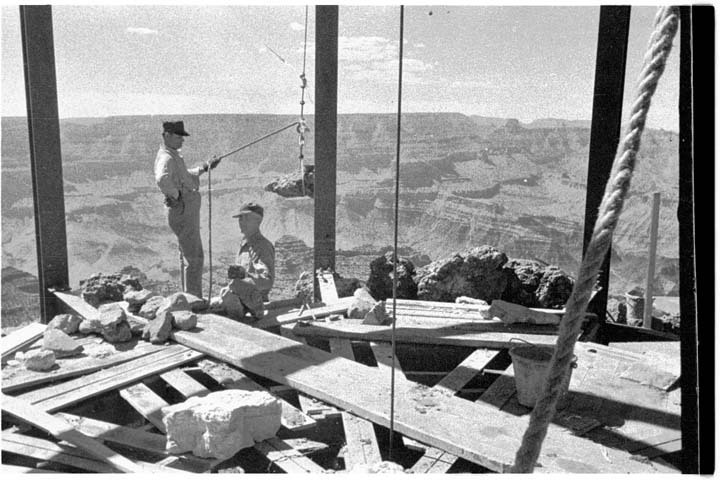 The floor was finished on black stone slabs and for the wooden ceiling they reused the logs of the first inn built in Grand Canyon, which was being demolished at the time. A small fireplace and a wooden ladder were included in the centre of the room as homage of those sacred places. Regarding the furniture, wooden tables, benches and stools where built with materials found in the surrounding area. 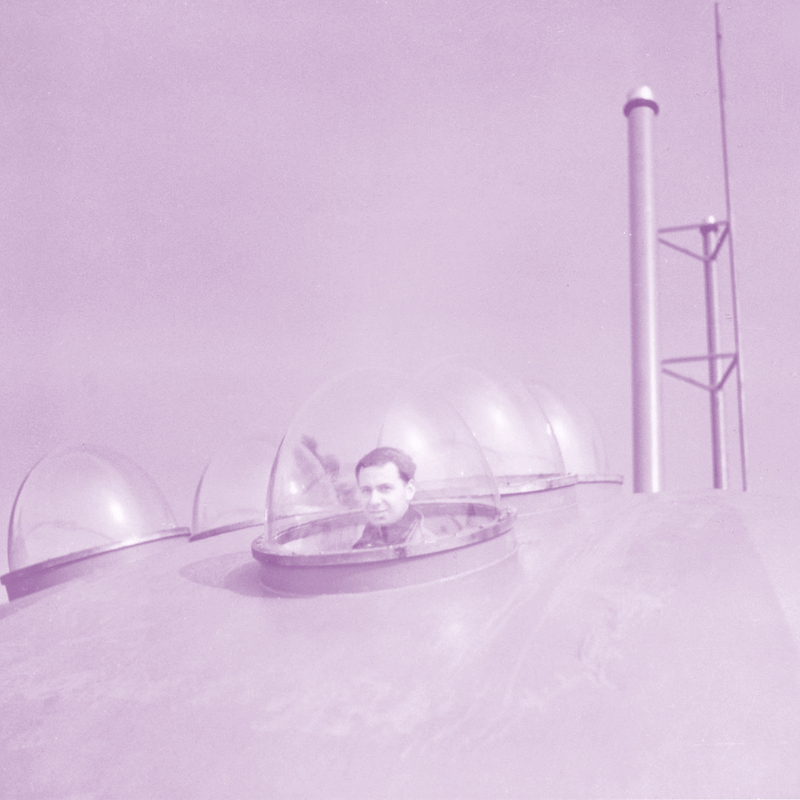 The flat roof, which is accessible via an external stair, works as an observation deck. A la torre se accede a través de una sala inspirada en una antigua kiva. Una kiva es un espacio circular excavado, generalmente con cubierta de madera, que era utilizado por los habitantes de los pueblos nativos para sus celebraciones religiosas, espirituales o políticas. Se caracterizan por tener un anillo central para hacer fuego y una escalera de mano de madera por la que se desciende a la habitación a través dela únicaapertura situada en el centro de la cubierta. La interpretación de Colter debía responder a otro uso, por lo que el espacio fue construido a nivel del suelo. En planta es una también una circunferenciapero en este caso con grandes ventanales abiertos en el muro de piedra para asegurar las impresionantes vistas del Cañón. Bajo uno de los ventanales, la arquitecta diseñó una chimenea con salida directa al exterior a través del muro. El pavimento es de losas de piedra negra irregulares y el techo es un entramado de madera para el que se utilizaron elementos de madera rescatados del primer alojamiento construido en el Gran Cañón que estaba siendo desmantelado. En el centro de la habitación fueron incluidos un anillo para el fuegoy una escalera de madera como homenaje a estos espacios sagrados. El escaso mobiliario, mesas, bancos y taburetes de madera, fue expresamente diseñado usando materiales encontrados en los alrededores.La cubierta plana, accesible a través de una escalera exterior, sirve como mirador. 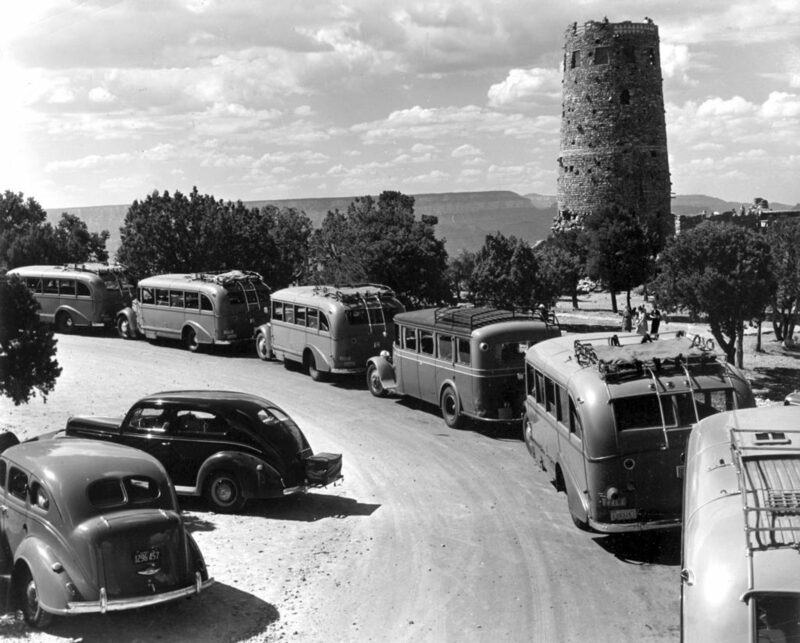 Fred Harvey tour busses parked in front of the Desert View watchtower. 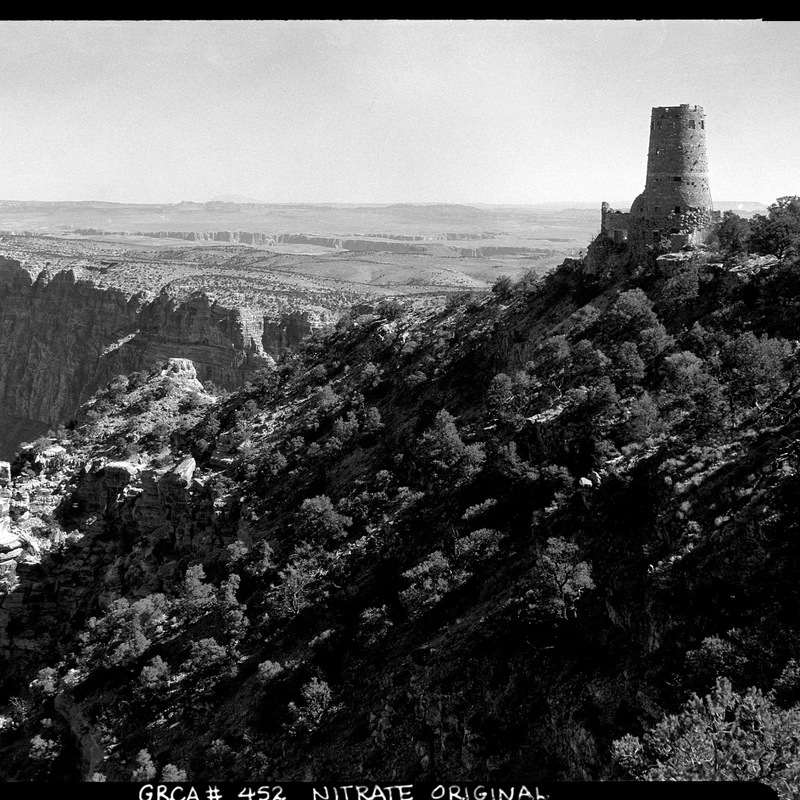 Circa 1938 NPS. 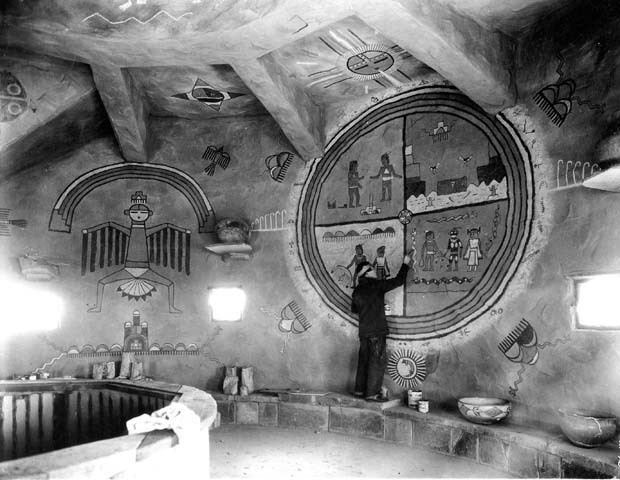 Hopi artist Fred Kabotie painting the snake legend mural in the Desert View Watchtower. Grca 22671a circa 1932. Fred Harvey co. The tower is tapering in diameter from 30 feet at the base to 24 feet at the top. It raises 4 storeys on top of ground floor, of which the first, second and third levels are connected through a central void creating a triple height. The ascension starts once leaving the kiva. Two things happen then: the entrance to an inner world rich with symbolism and on the contrary the search for the outer landscape. Museum and vantage point at the same time: a look to History and to Nature. 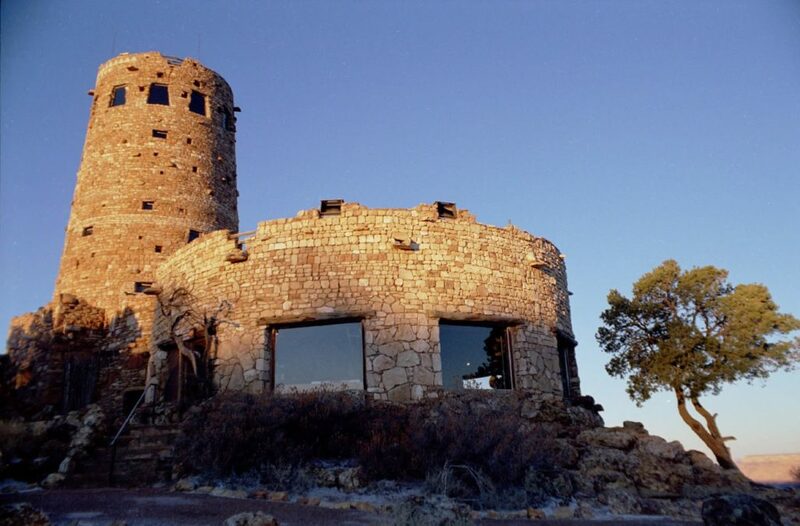 The top floor, which is called ‘The Eagle nest’, presents no decoration and large windows that offer a panoramic view 70 feet over the Canyon’s rim. The architect chose a brownish mortar forthe stonework finish in order to create a rustic effect. The colourful paintings, which extend along walls and ceilings, are highlighted on the pale background. Colter recommended Hopi artist Fred Kabotie for this task. The main artwork is a large circular mural that portraits the Hopi snake legend: the story of the first man to navigate the Colorado River. The flights of the stair are located at the same point on all floors creating a flow around the central void. The result is a spiral promenade that strengthens those opposed emotions mentioned above: on one hand the obscure cave world and on the other hand the bright wild world. The lighting, both the natural and artificial, was designed carefully. The daylight comes in through multiples openings creating strong shadows, whereas the artificial lightis reflected on the walls lighting up the paintings. La torre es un cilindro con un diámetro de 30 pies (9 metros) en su base que disminuye hasta los 24 pies (7 metros) en su parte superior. Tiene 4 niveles sobre la planta baja, de los cuales los tres primeros están conectados por un vacío central creando una triple altura. El ascenso a la torre comienza tras abandonar la kiva y con él ocurren dos cosas: la entrada a un mundo interior de simbolismo reflejado en los muros y la búsqueda del paisaje exterior. Museo y mirador, mirada a la historia y a la naturaleza. La planta superior, llamada “El nido del águila”, es independiente, carece de decoración y en ella se encuentran los grandes ventanales que ofrecen una panorámica de 360 grados a 20 metros de altura sobre el borde del Cañón. Para el interior de los muros de piedra la se escogióun acabado de mortero toscamente aplicado con el fin crear un efecto rústico. Sobreel tono tostado destacan los colores vivos de los murales y pinturas que se exhiben a lo largo de las superficies, sin distinción entre planos verticales u horizontales. La arquitecta eligió a Fred Kabotie, un joven artista Hopi, para la realización de las pinturas. La obra principal es un gran mural que narra la legenda Hopi de la serpiente: la historia del primer hombre en navegar el rio Colorado. Los tramos de escalera están situados unos sobre los otros generando un recorrido circular alrededor del vacío central. El resultado es una promenade en espiral que potencia en el visitante las sensaciones aparentemente contrapuestas mencionadas anteriormente: la del mundo introvertido y obscuro del interior rupestre y la del exterior deslumbrante y salvaje. La iluminación, tanto natural como artificial, fue pensada cuidadosamente. La luz diurna accede al interior a través de múltiples aperturas generando grandes contraluces y potentes sombras. Sin embargo la iluminación artificial es indirecta, iluminando los muros para destacar las pinturas. 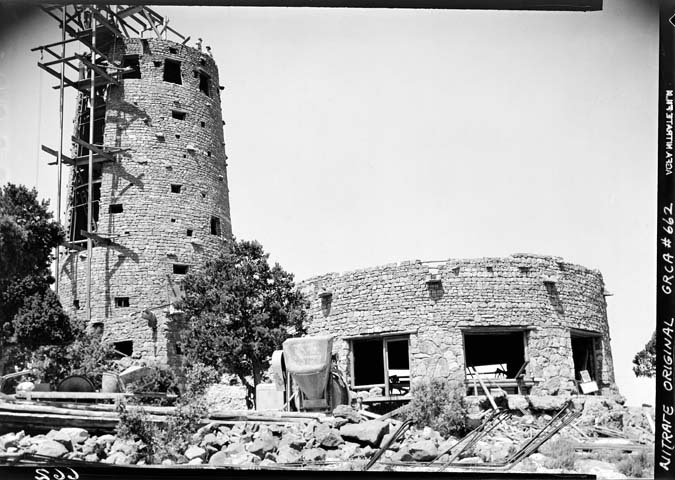 Regarding the constructionof the tower, it differs from its historic precedents. 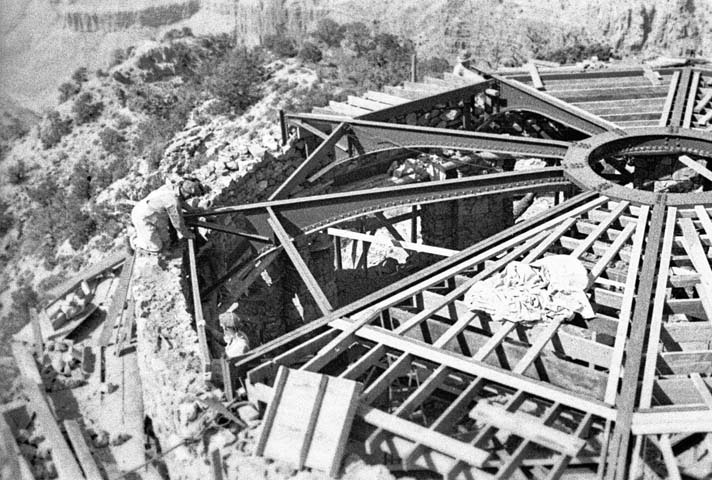 Due to its expected live load, its wind and rain exposure and its extreme location Mary Colter thought about a circular steel structure erected on concrete foundations. 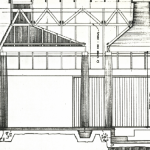 She designed a steel frame that supported both the floors and the stonework. According to her idea, the building raises from the remaining of a ruin. In order to achieve it, the architect decided to place local boulders and stones around the foundations. There are many deep set windows of all short of sizes located randomly on the wall, being the larger ones located on the top. The warm golden-coloured stonework exhibits a high level of craftsmanship. The architect spent long time on carefully choosing the position of each stone, creating a composition that was seen as it always has been there at first sight. The stones were sorted by size and colour so lighter bands can be found in different places. The wallsare much more than an envelope; there are plenty of details shown on them. These details aim to tell all those things that Colter found while studying Native American´s culture. There are petroglyphs on some of the bigger stones, recreating the ones she saw in some ruins, T-shaped doors and many different decorations and even built-in cracks. Constructivamente el proyecto difiere de sus referentes históricos. La mayor escala del edificio, las sobrecargas de uso a las que iba a ser sometido, su fuerte exposición al viento y la lluvia y su extrema localización en el borde del Cañón llevaron a Mary Colter a decidirse por una estructura metálica sobre cimientos de hormigón. La arquitecta diseñó un esqueleto metálico que soportara los diferentes forjados y alrededor del cual se levantarían los muros de piedra. Según su diseño la torre parece emerger de entre los restos de una ruina junto con la kiva. Para conseguir esto y con la intención de no dejar los cimientos expuestos, se dispusieron rocas de diferentes tamaños alrededor que dan una continuidad visual al conjunto. Por toda la torre encontramos aberturas de diferentes tamaños dispuestas de manera aparentemente casual, encontrándose las ventanas más grandes en la parte superior. La piedra, elemento principal del proyecto, fue mayoritariamente recogida de los alrededores y se caracteriza por su color dorado.Su disposición, tanto en la torre como en la kiva fue pensada minuciosamente y supervisada por Colter. Las piezas fueron colocadas en bandas de tamaño similar siguiendo su diseño. Al igual que por tamaño fuero agrupadas por tonalidades, pudiendo distinguirselíneas más claras en ciertas partes. El cerramiento pétreo del conjunto es mucho más que uno muros curvos, son paredes llenas de historias, detalles y simbolismo. Detalles pensados para contar aquello que ella había descubierto durante su profundo estudio de la cultura de los antiguos pueblos indios. Algunas de las piedras de gran tamaño exhiben petroglifos inspirados en los encontrados en sitios históricos, puertas en forma de ‘T’ parcialmente tapiadas, grandes piezas rodeadas de otras más pequeñas a modo de parche en el muro, detalles decorativos e incluso grietas expresamente diseñadas. Mural. 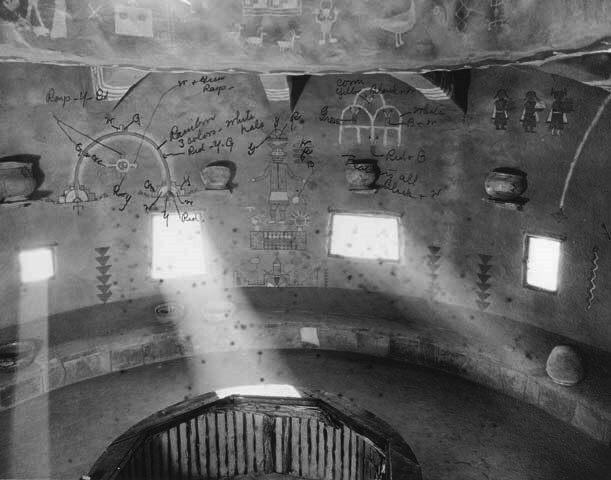 Mary Colter’s written notation over photo. Circa 1932. Fred Harvey co.
Each of the buildings designed by Mary Colter tells a story and creates a unique atmosphere. 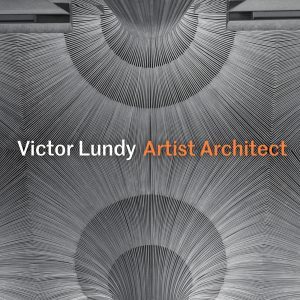 This project, which is considered her masterpiece, was done when she was on her sixties. She dedicated most of her life to learn and understand Native American culture. This provided her with the knowledge and inspiration required to develop her projects. 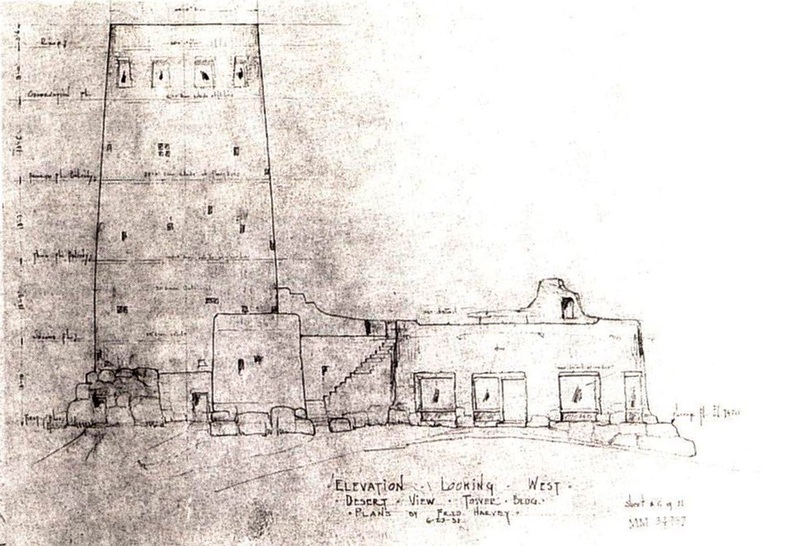 Desert View Watchtower synthesised her career and reflects her contribution, passion and deep admiration for the Native American people of the Southwest. Cada edificio diseñado por Mary Colter cuenta una historia y genera una atmósfera única. Este proyecto es considerado su obra más destacada y la llevó a cabo cuando contaba con 67 años. Toda una vida de acercamiento einvestigación le permitieron obtener el conocimiento y la inspiración necesarios para su desarrollo. Desert View Watchtowersintetiza su carrera como arquitecta y refleja su contribución, pasión y profunda admiración a los pueblos indígenas del oeste americano. 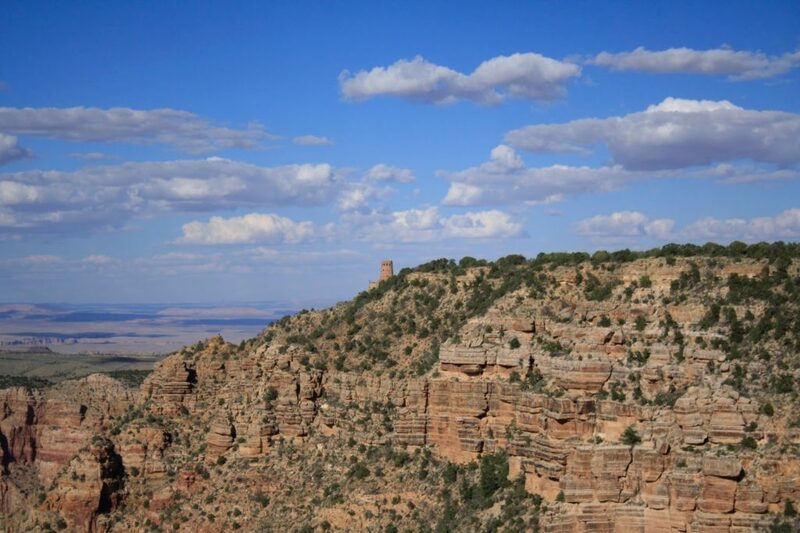 View Northeast – Desert View Watchtower. Little Colorado River gorge behind at sunrise. 01 oct 1935. NPS photo by George Grant. 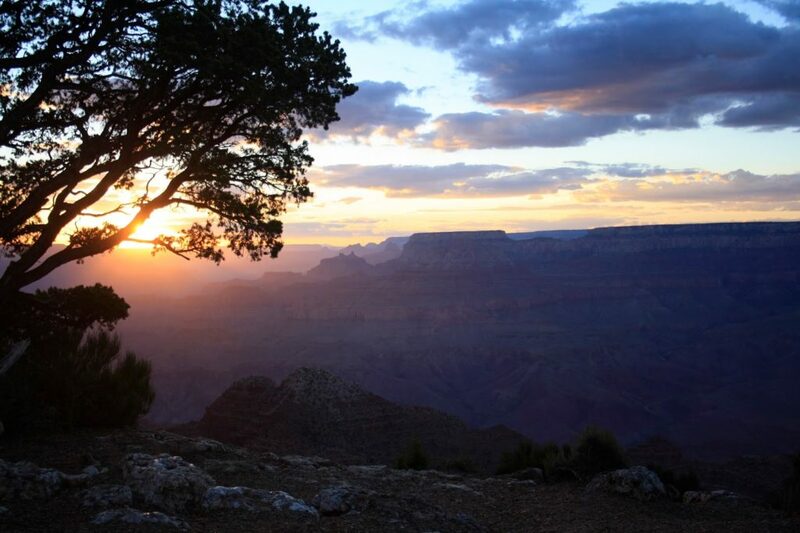 Sunrise on Colter’s Desert View Watchtower, GRAND CANYON NATIONAL PARK.